Five-year-old full sisters Fiontini and Fiontina pulled off a unique double at the World Championship for Young Dressage Horses at Verden at the weekend, taking out the top two places in their age class. 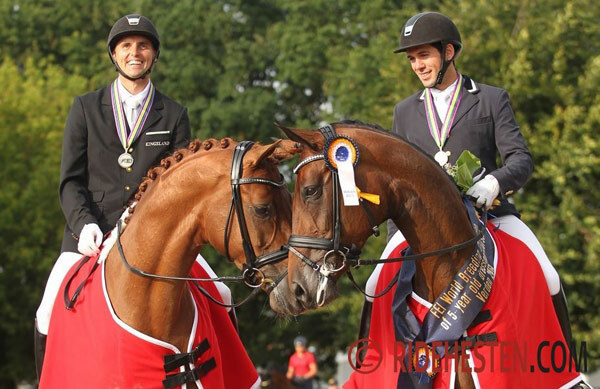 The Danish Warmlood pair, ridden by Spain’s Severo Jesus Jurado Lopez and Denmark’s Andreas Helgstrand respectively, have the same parents (Fassbinder / Blue Hors Romanov), but were born by embryo transfer and carried by surrogate mares. They were born two and a half months apart. The bay Fiontini, who had earlier won the qualifying competition, took the title with a final score of 9.18. The chestnut Fiontina, who was eighth in the qualifier, improved to finish just a whisker behind on 9.02. The bronze medal went to the hanoverian stallion Quantensprung (Quando-Quando / Donnerhall) who achieved 9.1 for trot and a total of 8.96 with German rider Vera Nass. Fiontini and Fiontinawere bred in Denmark by Hanne Lund and Henrik Hansen. And in a masterful move for Danish breeding, Fiontini already has a foal by Sezuan, the Danish-bred six-year-old winner at Verden. The foal is named Souvenir. When Fiontini and Fiontina competed at the Blue Hors Championships for Young Dressage Horses at the Danish Stallion Licensing in March, they impressed Olympic champion Charlotte Dujardin, who was the test rider.